Note: Your information will be saved in our secure internal forms for use solely in communication about your involvement in this event. You will not be added to any email lists and your data will not be shared with any 3rd party email providers. Please contact us if you have any questions about our secure handling of your information for the purposes of our golf outing. Your participation fees and sponsorship donations will go toward the operation and costs of running the Nicholas J. Murphy Military Legal Clinic. The Nicholas J. Murphy Military Legal Clinic offers free and reduced rate family law legal services to veterans and active duty members of the Armed Forces and their families in the areas of divorce, custody, child support and all areas of family law in Peoria, Bloomington, and throughout Illinois. Our overall goal in 2019 is to raise enough money to hire a full-time attorney and a full-time paralegal to operate the Nicholas J. Murphy Military Legal Clinic. If we can do that, there is no limit on the number of cases we can handle and the number of veterans and active duty service personnel we can help. The proceeds of the golf outing are the primary fundraiser we have for the Nicholas J. Murphy Foundation. Over the last 28 months, we have undertaken 88 family law cases and completed almost $500,000.00 worth of free legal services through the Nicholas J. Murphy Military Legal Clinic. We are proud of what we have accomplished in honor of Nick Murphy and look forward to the continued growth of the Nicholas J. Murphy Foundation. Your support will allow us to continue to “Pay it Forward” and help veterans and military personnel in need. We would like to thank you for your interest in the 2019 “Fairways for the Armed Forces” Golf Outing. Please see the information below about the different levels of sponsorship, and click on the links above to sign up. All Title Sponsors will have donated $25,000.00 and be a Title host of the golf tournament, along with the Nicholas J. Murphy Foundation. All Title Sponsors will have their company name as the Title host on all publications, banners and brochures promoting the golf outing. Currently, the law firm of Murphy and Dunn, P.C. is signed up to be a Title Sponsor. We would love to have additional Title Sponsors join us. The Nicholas J. Murphy Foundation is proud to announce that the law firm of Murphy & Dunn, P.C. has pledged to be the first Title Sponsor of the 2019 “Fairways for the Armed Forces” Golf Tournament. Murphy & Dunn, P.C. is the largest and most successful divorce, custody, and family law firm in Central Illinois devoted to serving individuals and families throughout the State of Illinois. As well, all of their attorneys and paralegals volunteer extensively with the Nicholas J. Murphy Military Legal Clinic to complete the legal work necessary to properly represent the service men and women being helped through the clinic. All Platinum Sponsors will have donated $10,000.00 and be included as one of the major sponsors of the golf tournament. All Platinum Sponsors will have their name or their company name as one of the top billing spots and listing on all publications, banners and brochures promoting the golf tournament. A Gold Star Sponsor will have donated $5,000.00 and be included as one of the large sponsors of the golf tournament. All Gold Star Sponsor will have their name or their company name on all publications, banners and brochures promoting the golf tournament, right below the Platinum Sponsors. The Nicholas J. Murphy Foundation is proud to announce that Tom and Lana Frake have become the first Gold Star Sponsor of the 2019 “Fairways for the Armed Forces” Golf Tournament. Tom and Lana have sponsored each year of the golf tournament and are long time supporters of the Nicholas J. Murphy Foundation. Thank you Tom and Lana for your continued support. A Blue Star Sponsor will have donated $2,500.00 and be included as one of the sponsors of the golf tournament. The Blue Star Sponsor will have their name or their company name on all publications, banners, and brochures promoting the golf tournament, listed right below the Gold Star Sponsors. The Nicholas J. Murphy Foundation is proud to announce that Chris and Karyn Winkel have become the first Blue Star Sponsor of the 2019 “Fairways for the Armed Forces” Golf Tournament. Chris and Karyn have sponsored each year of the golf tournament and are long time supporters of the Nicholas J. Murphy Foundation and friends of the Murphy family. Thank you Chris and Karyn for your continued support. The Nicholas J. Murphy Foundation thanks Vicki Hosek for becoming the second Blue Star Sponsor of the 2019 “Fairways for the Armed Forces” Golf Tournament. Vicki has sponsored each year of the golf tournament and is a long time supporter of the Nicholas J. Murphy Foundation and friend of the Murphy family. Thank you Vicki for your continued support. A Silver Star Sponsor will have donated $1,000.00 and be included as one of the sponsors of the golf tournament. All Silver Stare Sponsors will have their name or their company name on all publications, banners, and brochures promoting the golf tournament, listed right below the Blue Star Sponsors. The Nicholas J. Murphy Foundation is proud to announce that Mark Hoagland and Stanley Steemer have become the first Silver Star Sponsor of the 2019 “Fairways for the Armed Forces” Golf Tournament. 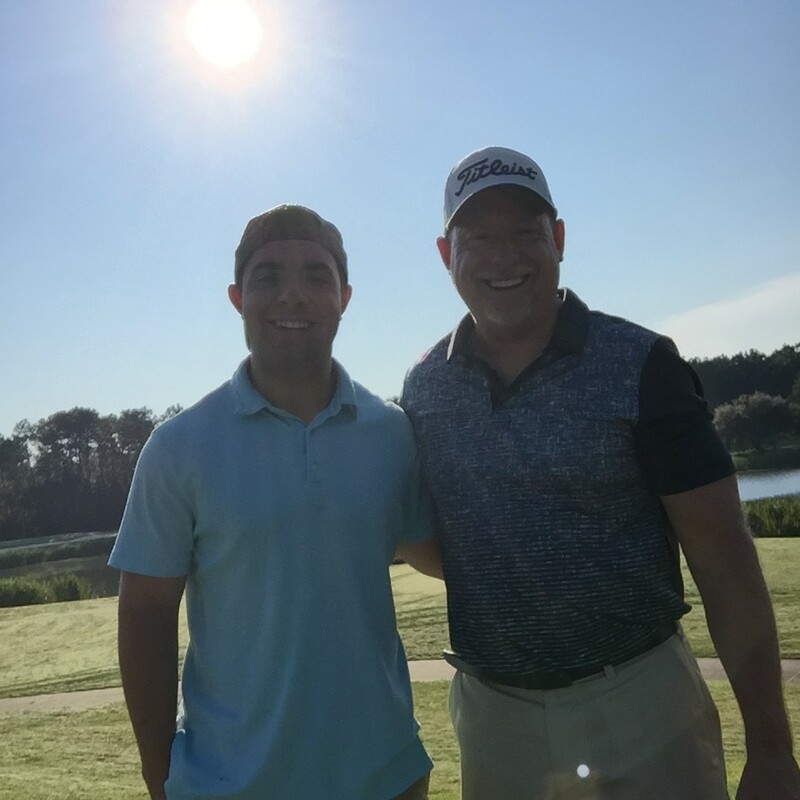 Mark and Stanley Steemer have sponsored each year of the golf tournament and Mark is a former coach, friend, and supporter of the Nicholas J. Murphy Foundation and a friend of the Murphy family. Thank you Mark and Stanley Steemer for your continued support. The Nicholas J. Murphy Foundation thanks Matt Vonachen and the Vonachen Group for becoming the second Silver Star Sponsor of the 2019 “Fairways for the Armed Forces” Golf Tournament. 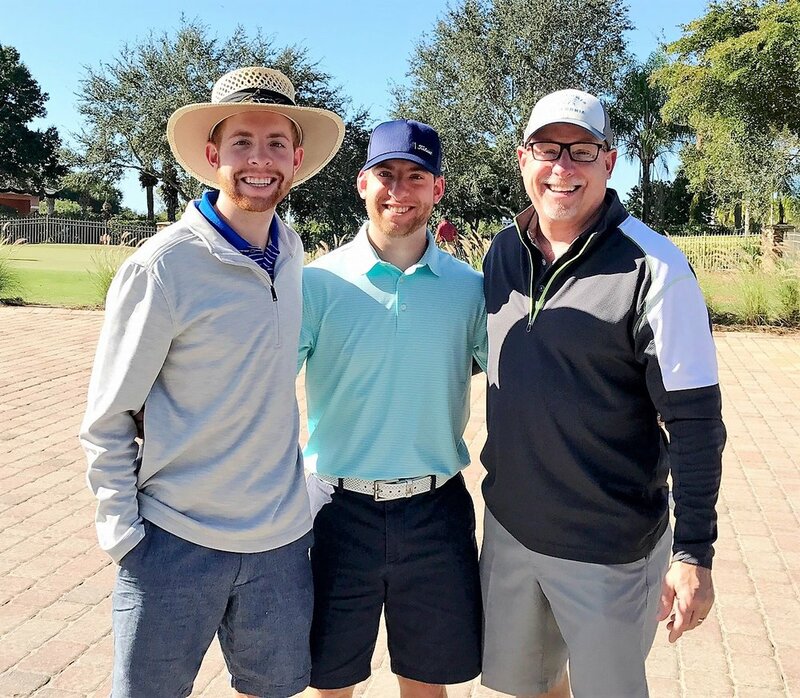 Matt has sponsored each of the last two years of the golf tournament and is a long time supporter of the Nicholas J. Murphy Foundation and friend of the Murphy family. Thank you Matt for your continued support. A Bronze Star Sponsor will have donated $500.00 and be included as a sponsor of the golf tournament. Though we thank all Bronze Star Sponsors for their contribution to the Nicholas J. Murphy Foundation, they will not be listed on the marketing materials sent out for the golf tournament. We thank the Bronze Star Sponsors for having an impact in helping maintain operations for the best golf tournament in the Central Illinois area. The Nicholas J. Murphy Foundation is proud to announce that Jeff and Kim Dunn, along with their kids, Jake and Maddie have pledged to become the first Bronze Star Sponsor of the 2019 “Fairways for the Armed Forces” Golf Tournament. Jeff, Kim, and their kids have participated and sponsored a hole each year of the golf tournament and the Dunn’s are cousins of Nick and the Murphy Family. They have gone out of their way to help and support the Murphy family and the Nicholas J. Murphy Foundation. Thank you Jeff, Kim, Jake, and Maddie for your continued support. The golf tournament will be offering a grilled lunch for both the morning and afternoon golfers' enjoyment. The Lunch Sponsor will have donated $2,000.00 and have their name or their company name on place cards at every table throughout the lunch hour. We are proud to announce that Steve and Maggie Jackson and Prairie Home Alliance has become the Lunch Sponsor for the 2019 “Fairways for the Armed Forces” Golf Tournament. Steven and Maggie have been great supporters of the Nicholas J. Murphy Foundation and we cannot be more thankful that they have decided to partner with us and support our many veterans and members of the Armed Forces. After the golf play is complete, there will be a reception at 6:00 p.m. to honor all military personnel, Nick Murphy, and the Nicholas J. Murphy Foundation. The reception will feature food, drinks, and a silent and live auction to complete the night. The Reception Sponsors will have donated $2,500.00 and have their name or their company name on place cards at every table throughout the reception. The Nicholas J. Murphy Foundation is proud to announce that J. Kevin Cmunt, Lisa Dodson, and Gift of Hope, Organ & Tissue Donor Network have pledged to become one of the Reception Sponsors of the 2019 “Fairways for the Armed Forces” Golf Tournament. Gift of Hope sponsored the reception last year as well. Additionally, there was a table set up to provide information and Kevin spoke at the reception to provide information about the thousands of families affected by organ and tissue donation each year. Gift of Hope is an incredable organization and supporter of the Nicholas J. Murphy Foundation. We can’t thank them enough for their continued support. We are happy to announce that Jeff and Maria Martin and Welch Systems, Inc. have become our second Dinner Reception sponsor for 2019. Their family and company has been a huge supporter of Nick’s Foundation since day one afer Nick’s death. Thank you so much for your support. It is because of families and companies like yours that make all of this possible. jeff and maria martin and Welch systems, inc.
Hole Sponsors will have paid $250.00. For that donation, the sponsor will have their name or their company name on a ground sign, located on the tee box of a hole for all golfers to see. john wetzel and phd services, l.l.c. Many donations of goods and services will be needed. Please let us know if you would like to donate your goods or services for the 2019 “Fairways for the Armed Forces” Golf Tournament. Foursomes will pay $600.00 to participate in the golf tournament. Each golfer will receive a substantial gift package for participating. Individual Golfers will pay $150.00 to participate in the golf tournament and receive a substantial gift package for participating. Please sign up early as the afternoon will sell out quickly. Sponsors and Foursomes will be given a priority for the afternoon round. The following individually golfers have paid and are officially signed up for the 2019 golf tournament. If your name is not on this list, you are not officially signed up unless you are playing in a sponsors group. Below is a video of the 2018 Fairways for the Armed Forces Golf Outing. Please enjoy. Below is a video of the 2017 Fairways for the Armed Forces Golf Outing. Please enjoy. Thank you all so much for your support. See you on the green! Thank you all so much for your participation and support. Check out the video below from this year's event produced by Pat Clark Productions. The second annual "Fairways for the Armed Forces" golf outing was held on June 11, 2018. It was even bigger and better than last year. We had 184 golfers play in a morning and afternoon shotgun scramble and then were thrilled to welcome guest speaker Aaron Bernstein as our guest speaker at the evening reception. Aaron Bernstein is the heart recipient of Nick's heart donation. Aaron truly has the heart of a champion in him. Thank you to all who signed up, played, volunteered and donated their time, talent and treasure. We also gave away five $2,500 college scholarships to our worthy educational scholarship recipients. It is a joy to meet these outstanding young student-athletes and we look forward to watching their college careers develop and for them to continue to pay it forward on Nick's behalf. This golf event is one of the premiere golf outings in Central Illinois and we look forward to an even bigger and better event in 2019. A Platinum Sponsor is one of the Title Sponsors who will have their name or their company name as top billing and listing on all publications, banners and brochures promoting the golf outing. They donated $10,000.00 and be one of the title sponsors of the entire tournament. There will be a maximum of five title sponsors. That sponsor will also receive two foursomes (8 players) for golf included in that sponsorship and receive a hole sponsor sign. Title Sponsorship will be a huge amount of advertising for your company. You will also greatly benefit the Children's Hospital of Illinois, the educational scholarships, and to the Nicholas J. Murphy Foundation Pro Bono Clinic that is providing free family law legal services to active duty members and veterans of the Armed Forces . We are pledging that $5,000.00 out of the $10,000.00 raised for each Title Sponsor will be used as a grant to the Children's Hospital of Illinois, Almost Home Kids, or the Heller Cancer Center, all locally here at OSF. We are going to try and use the Title Sponsors as our main fundraising for the charitable arm of Nick's Foundation in 2018. As a result, your company will know directly who benefited from your Title Sponsorship and you will have a great time playing in the golf tournament. We are proud to announce that the law firm of Murphy & Dunn, located in Peoria and in Bloomington Illinois has pledged to be our first Platinum Title Sponsor for the 2018 Fairways for the Armed Forces charity golf outing. Murphy & Dunn is the largest and most successful divorce, custody and family law firm in Central Illinois devoted to serving individuals and families throughout the State of Illinois. Josh Bellamy and Ashley Flanagan from The Yard have pledged to be our second Platinum Title Sponsor. The Yard is a state of the art facility in Peoria that has an entire turf soccer field, five batting cages, and two full size turf baseball fields indoor in Pioneer Park for rent to all sports teams and all ages. Zach McAllister from the Cleveland Indians was just there last week giving a clinic. Please support The Yard and thank Josh and Ashley if you see them. They are going above and beyond for the Nicholas J. Murphy Foundation. We now have a third Title Sponsor with Midwest Orthopaedic Center. CEO Derek Armstrong just confirmed that the doctors and staff of Midwest Orthopaedic Center have committed again this year to a $10,000.00 donation in support of Nick's Foundation. Thank you so much guys. This is the second year in a row they have made such a commitment to support Nick's Foundation. Our fourth Title Sponsor is Lorenz Evans and his company, Lorevas, Inc. Please support Lorenz and his numerous companies. They have been a great friend to the Nicholas J. Murphy Foundation and continue to be so. That is a substantial amount that we are donating to the Children's Hospital and OSF, the Heller Center for Learning for Kids with Cancer, and the Anthony Rizzo Foundation, also to help kids with cancer) from Nick's Foundation for 2018. Thank you so much for your support. In addition, these funds will help support the educational college scholarships going to senior high school student-athletes, and help fund the Nicholas J. Murphy Foundation Pro Bono Clinic. That Clinic is providing free and reduced rate family law legal services through the clinic and through the law firm of Murphy & Dunn to veterans and to active duty military in the areas of divorce, custody, child support and all areas of family law to pay them back for their service and sacrifice to our country. Just like Nick Murphy sacrificed his life in joining the U.S. Navy in his goal to become a Navy SEAL, these men and woman have also risked everything and we want to pay them back for that sacrifice, commitment and bravery. The Law Firm of Murphy & Dunn, P.C. A Gold Star Sponsor has donated $5,000.00 and will be included as a major sponsor of the tournament on all publications, banners and brochures. That sponsor will also receive one foursome (4 players) for golf included in that sponsorship and receive a hole sponsor sign. We are proud to announce that Advanced Technology Services, Inc. (ATS), through the support of our friend James Hefti, has pledged to be our first Gold Star Sponsor for the 2018 "Fairways for the Armed Forces" charity golf outing. Thank you Jim ands ATS for such a huge pledge and for all of your support. We are also pleased to announce that Tom and Lana Frake and their family have pledged to be our second Gold Star sponsor. Tom and Lana and their family were great supporters of Nick Murphy and our family and continue to be great friends and great support of the Nicholas J. Murphy Foundation. Thank you so much. A Blue Star Sponsor donated $2,500.00 and will be included as a large sponsor of the tournament on all publications, banners and brochures. That sponsor will also receive two golfers as part of the sponsorship and will receive a hole sponsor sign. A Silver Star Sponsor donated $1,000.00 and is included as a sponsor of the tournament on all publications, banners and brochures. That sponsor will also receive one player for golf included in that sponsorship and receive a hole sponsor sign. A Bronze Star Sponsor will donate $500.00 and is included as a small sponsor of the tournament. They will not be listed on the marketing materials, but they will receive one round of golf for 1 player included in that sponsorship as well as a hole sponsor sign. At the outing we will be offering a grilled lunch for both our morning and afternoon golfers' enjoyment. The lunch sponsor will donate $2,000.00 and have their name or their company name on place cards at the table throughout the lunch hour. After golf, we have food, drink and a reception to honor Nick and the Nicholas J. Murphy Foundation. The reception sponsor will donate $2,500.00 and have their name or their company name on place cards at the table throughout the reception after golf. Hole sponsors will pay $250.00. For that donation, they will receive a ground sign at the hole location for all golfers to see as a hole sponsor. 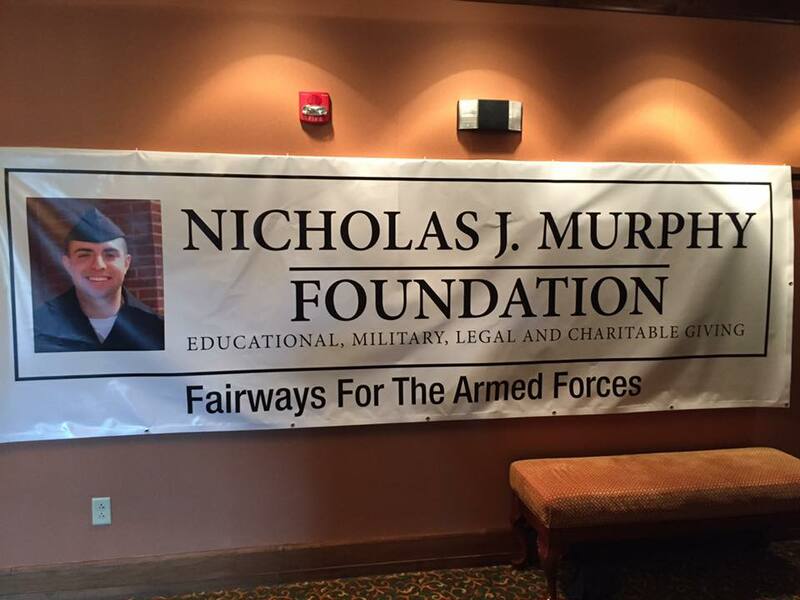 The Nicholas J. Murphy Foundation is proud to announce that the 2018 "Fairways for the Armed Forces" golf outing to honor Nick Murphy and to raise money for the educational, military, legal and charitable donations, grants and scholarships given out by Nick's Foundation is now scheduled for June 11, 2018 at Mt. Hawley Country Club. It will follow the same format from last year's tournament, which was a huge success. In 2017, we raised a net profit of over $50,000.00. That inaugural golf outing was held on June 12, 2017 at Mt. Hawley Country Club. Thank you to Pat Clark Productions for the wonderful video of the event. Click below to see the video. Wait until the end and watch all of it to see Nick himself playing golf with his Dad. All proceeds will go toward all of the scholarships, grants and donations being given out through the Nicholas J. Murphy Foundation, including current military and Armed Forces families in need, current and future high school and college student-athletes receiving college scholarships, toward the Nicholas J. Murphy Foundation Pro Bono Clinic to help provide free legal services to military families in need, and to the charitable donations to be made to the Children's Hospital of Illinois and Almost Home Kids. Thank you to our amazing golf committee, including Karyn and Chris Winkel, Cheryl and Dean Murin, Jamie and Ted Brodeur, Adam Winkel, and all of the Murphy family members (Ed, Theresa, Grant, Alec and Laney, as well as Maria Puetz) for all of your help in putting this tournament together. You are all awesome and have been wonderful to donate all of your time, talent and treasure. This is a big undertaking, and we want all of you to know how much we appreciate your love and friendship. It has been a struggle for all of us Murphys and we truly value and appreciate all of our extended family and friends in helping us since Nick's death. Thank you also to all of our sponsors and volunteers. We raised over $50,000.00 net profit in 2017 because of all of their donations and hard work in putting this together. Please visit our Sponsor Page and visit and use their companies to pay them back for all of their hard work and contributions. Also do not hesitate to thank personally all of the volunteers who made this possible. We had over 50 individual volunteers, in addition to the golf committee, help put this golf outing together and it was because of their hard work and dedication that it was such a success. Our community stepped it up and came together for this event and we are very proud and humbled to be a part of this great community. Central Illinois is truly a special place to live. Finally, a big thank you to God and to Nick Murphy. If it were not through our faith in God and Him getting us through all of this as a family and as a community, none of this would be possible. We truly believe that Nick Murphy is watching over us with that big Nick Murphy smile gracing us with his presence in all that we do. We know now more than ever that "Paying it Forward" in all that we do from this time forward is the right course of action and that helping others will not only make the world and our community a better place, but bring benefit to us all. We will see Nick again and we have no doubt that when we do he will still be smiling at us. That brings great joy to our hearts. Thank you again everyone. Gold Star Sponsor: A Gold Star Sponsor donated $5,000.00 and will be included as a major sponsor of the tournament on all publications and brochures. That sponsor also received two foursomes (8 players) for golf included in that sponsorship. Blue Star Sponsor: A Blue Star Sponsor donated $2,500.00 and will be included as a large sponsor of the tournament on all publications and brochures. That sponsor also received one foursome (4 players) for golf included in that sponsorship. Reception Sponsor: After golf, we have food, drink and a reception to honor Nick and the Nicholas J. Murphy Foundation. The reception sponsor donated $2,500.00 and this year that reception was sponsored by The Yard (Josh Bellamy). Silver Star Sponsor: A Silver Star Sponsor donated $1,000.00 and is included as a sponsor of the tournament on all publications and brochures. That sponsor also received two players (2 players) for golf included in that sponsorship. Bronze Star Sponsor: A Bronze Star Sponsor donated $500.00 and is included as a sponsor of the tournament on all publications and brochures. That sponsor also received one round of golf for 1 player for golf included in that sponsorship. Hole Sponsors: Hole sponsors paid $200.00. For that donation, they received a ground sign at the hole location for all golfers to see as a hole sponsor. THANK YOU so much EVERYONE. PLEASE SUPPORT OUR SPONSORS.